The Vikings have re-signed defensive tackle David Parry, the club announced on Tuesday. Minnesota has already placed cornerback Mike Hughes on injured reserve, so it doesn’t need to make another roster move to accommodate Parry. Parry will make his return to the Vikings roster after appearing in two games for the team earlier this season. The 26-year-old Parry played in Minnesota’s first two games of the year and even recorded a sack, but was cut after the Vikings decided to bring back veteran defensive tackle Tom Johnson. He’s been on the workout circuit since, meeting with the Seahawks, Lions, and Patriots. Parry’s most extensive NFL experience came with the Colts, who made him a fifth-round pick in 2015. 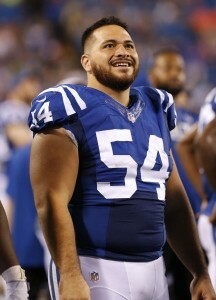 A Stanford product, Parry started 32 consecutive games to open his career with Indianapolis, racking up 78 tackles and four sacks in the process. After being arrested for an alcohol-related incident in March 2017, Parry was cut the following September and landed on the Saints’ practice squad. He was subsequently hit with a four-game suspension and appeared in only a single contest for New Orleans. Parry will now serve as a depth on a Vikings roster that already has five other defensive tackles. Sheldon Richardson, Linval Joseph, Johnson, Jalyn Holmes, and Jaleel Johnson have all been active in each of the past two weeks, so it could conceivably be Parry that doesn’t suit up on Sunday. The Seahawks worked out veteran defensive tackle David Parry on Monday, a source tells NFL.com’s Ian Rapoport (on Twitter). Parry became available when the Vikings cut him to make room for Tom Johnson, who was made available after being released by the Seahawks. If the Seahawks sign Parry, it will effectively complete a one-for-one swap of defensive tackles between Seattle and Minnesota. It’s a “trade” that the Seahawks did not want to make. The Seahawks cut Johnson before their Week 2 contest in order to sign a reserve safety for depth, but hoped to re-sign Johnson after the game was over. The Vikings foiled their plans, however, and quickly scooped him up. Parry appeared in each of the Vikings’ first two games and recorded a sack in their tie against the Packers in Week 2. The Vikings have released defensive lineman David Parry, according to a team announcement. Parry’s release makes room for the signing of Tom Johnson, who agreed to return to Minnesota on Tuesday. Parry appeared in each of the Vikings’ first two games and even recorded a sack in their tie against the Packers on Sunday. But, something had to give after Johnson, a fellow interior defensive lineman, was brought back. Parry started 32 games for the Colts as a nose tackle in Indianapolis’ 3-4 scheme, but a bizarre incident in February of last year put his football future into jeopardy. Parry was alleged to have attacked a taxi cart driver, car(t)jacked the vehicle, and threatened police officers. At one point in time, Parry was facing jail time with four charges against him. One of the charges was for committing a “Super Extreme” DUI in the state of Arizona, since he operated the cart with a high blood alcohol level. Last year, Parry hooked on with the Saints, but missed the bulk of the year due to injury. Fortunately, Parry is healthy and has put distance between himself and his embarrassing arrest, so he shouldn’t have trouble finding work.